The UK's best choice of used and refurbished machines. All the top brands and classic games. Lowest prices guaranteed, free delivery and installation, backed by award winning service. Used arcade machines are one of our specialities at Home Leisure Direct, and we have a great range of used arcade machines for sale. Our range incorporates many popular games that we have all enjoyed playing in arcades throughout the years. Generally these machines have been used commercially in arcades for a few years and so show signs of use, but are in perfect working order. Buying a used arcade machine is a great way to purchase a top title arcade machine, when looking for a cheap arcade cabinet for sale. All of our used arcade machines are sold in working condition and are perfect for an impressive centerpiece in a games or leisure room at home, or can alternatively be used in commercial environments. Due to the nature of buying used products, all of these machines vary in condition, so if you're interested in one, give our friendly team a call or an e-mail for more information about that individual product. We are able to source almost any used arcade machine title you might be looking for, through our network of top manufacturers and vintage games restorers. However, if you are looking for any titles older than about 12 months that aren't on our used section of the site, please call one of our friendly sales staff to see if they can find what you're looking for through our national network of dealers. 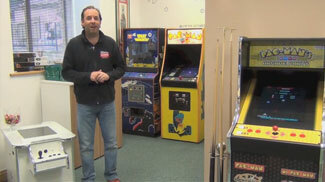 We provide a 12 months parts warranty and 6 months commercial parts warranty with all of our used arcade machines. Please note that this doesn't cover accidental damage or mis-use.